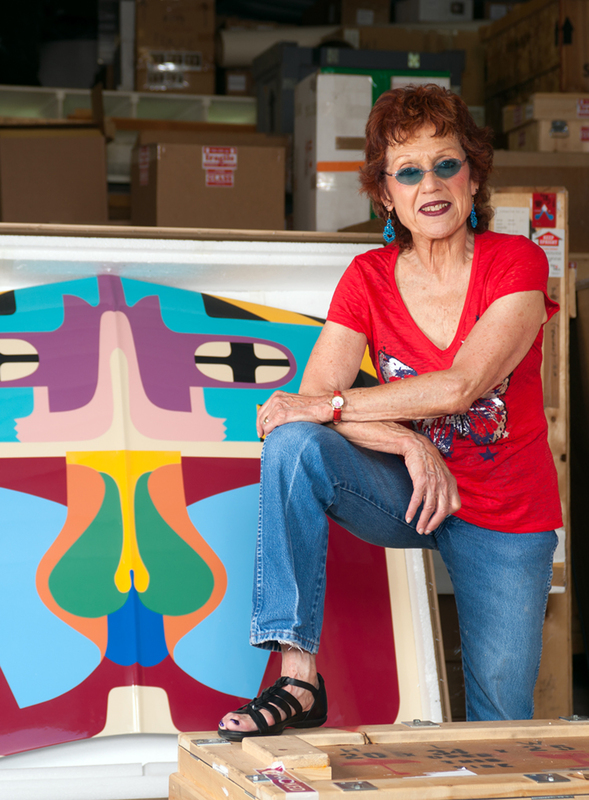 Born July 20, 1939 – Chicago, IL Judy Chicago is an artist, author, feminist, educator, and intellectual whose career now spans five decades. Her influence both within and beyond the art community is attested to by her inclusion in hundreds of publications throughout the world. Her art has been frequently exhibited in the United States as well as in Canada, Europe, Asia, Australia, and New Zealand. In addition, a number of the books she has authored have been published in foreign editions, bringing her art and philosophy to readers worldwide. In the early seventies after a decade of professional art practice, Chicago pioneered Feminist art and art education through a unique program for women at California State University, Fresno, a pedagogical approach that she has continued to develop over the years. In 1974, Chicago turned her attention to the subject of women’s history to create her most well-known work, The Dinner Party, which was executed between 1974 and 1979 with the participation of hundreds of volunteers. This monumental multimedia project, a symbolic history of women in Western Civilization, has been seen by more than one million viewers during its sixteen exhibitions held at venues spanning six countries. The Dinner Party has been the subject of countless articles and art history texts and is included in innumerable publications in diverse fields. The impact of The Dinner Party was examined in the 1996 exhibition, Sexual Politics: Judy Chicago’s Dinner Party in Feminist Art History. Curated by Dr. Amelia Jones at the UCLA Armand Hammer Museum, this show was accompanied by an extensive catalogue published by the University of California Press. Jones’ analysis has been updated and expanded in historian Jane Gerhard’s book The Dinner Party: Judy Chicago and the Power of Popular Feminism, 1970-2007, published by the University of Georgia Press. In 2007, The Dinner Party was permanently housed at the Brooklyn Museum as the centerpiece of the Elizabeth A. Sackler Center for Feminist Art, thereby achieving Chicago’s long-held goal. Recently, Chicago published a final updated book, The Dinner Party: Restoring Women to History (The Monacelli Press, 2014). From 1980 to 1985, Chicago worked on the Birth Project. Having observed an absence of iconography about the subject of birth in Western art, Chicago designed a series of birth and creation images for needlework which were executed under her supervision by 150 skilled needle workers around the country. The Birth Project, exhibited in more than 100 venues, employed the collaborative methods and a similar merging of concept and media that characterized The Dinner Party. Exhibition units from the Birth Project can be seen in numerous public collections around the country including The Albuquerque Museum where the core collection of the Birth Project has been placed to be made available for exhibition and study. While completing the Birth Project, Chicago also focused on individual studio work to create PowerPlay. In this unusual series of drawings, paintings, weavings, cast paper, and bronze reliefs, Chicago brought a critical feminist gaze to the gender construct of masculinity, exploring how prevailing definitions of power have affected the world in general — and men in particular. The thought processes involved in PowerPlay, the artist’s long concern with issues of power and powerlessness, and a growing interest in her Jewish heritage led Chicago to her next body of art. The Holocaust Project: From Darkness Into Light premiered in October 1993 at the Spertus Museum in Chicago, then traveled to museums around the United States until 2002. Selections from the project continue to be exhibited. The Holocaust Project involved eight years of inquiry, travel, study, and artistic creation. It is comprised of a series of images merging Chicago’s painting with the innovative photography of Donald Woodman, as well as works in stained glass and tapestry designed by Chicago and executed by skilled artisans. Resolutions: A Stitch in Time was Judy Chicago’s last collaborative project. Begun in 1994 with skilled needle workers with whom she had worked for many years, Resolutions combines painting and needlework in a series of exquisitely crafted and inspiring images which – with an eye to the future – playfully reinterpret traditional adages and proverbs. The exhibition opened in June 2000 at the Museum of Art and Design, New York, NY, and was toured to seven venues around the United States and Canada. In 2011 and 2012, Chicago’s important contributions to southern California art were highlighted in Pacific Standard Time, a Getty funded initiative documenting and celebrating the region’s rich history. She was featured in eight museum exhibitions and kicked off the Getty PST Performance Festival with the restaging of two events, Sublime Environment (a dry ice installation) and A Butterfly for Pomona, the first fireworks piece Chicago had done since 1974. This reevaluation of her work has led to renewed interest in Chicago’s work around the United States and Europe. In 2014, in honor of Chicago’s 75th birthday, a series of exhibitions and events were held around the country at various institutions and galleries including the Palmer Museum at Penn State University (where there was a semester-long, campus wide celebration of Chicago’s art education archive which was acquired by the university in 2011); the National Museum of Women in the Arts; the Schlesinger Library on the History of Women in America at the Radcliffe Institute/Harvard; Mana Contemporary, Jersey City, sponsored by Nyehaus; the Elizabeth A. Sackler Center for Feminist Art, Brooklyn Museum; the New Mexico Museum of Art; David Richard Gallery in Santa Fe; and Redline in Denver. Her birthday year was capped off on April 26th when she presented, A Butterfly for Brooklyn. This complex pyrotechnic work in Prospect Park was attended by 12,000 people who – at the end of the performance – burst into spontaneous applause followed by singing “Happy Birthday.” 2015 and 2016 brought the inclusion of Chicago’s work in multiple museum exhibitions across the United States and Europe, including in Krakow, London, and Milan. In Bilbao and Bordeaux, the feminist curator Xabier Arakistain mounted the exhibition Why Not Judy Chicago?, an overview of Chicago’s career and an inquiry into the ongoing institutional resistance to Chicago’s work. In 2017, Chicago completed her fourth dry-ice installation titled, Be No More, for SFMOMA’s one year anniversary “Birthday Bash” and was commissioned by Tate Liverpool to create the spectacular, gigantic mural titled “Four Lads from Liverpool” to commemorate the 50 year anniversary of the Beatles’ album, Sgt Pepper’s Lonely Heart’s Club Band. Later in 2017, Chicago had solo exhibitions at Jessica Silverman Gallery in San Francisco, The Brooklyn Museum in New York, and the National Museum of Women in the Arts (NMWA) in Washington DC. The Brooklyn Museum and NMWA shows examined for the first time her creative process in The Dinner Party and explored the feminist studio environment she established. Judy Chicago’s most recent body of work, The End: A Meditation on Death and Extinction, will debut at the National Museum of Women in the Arts (NMWA) in Washington DC in the fall of 2019 to coincide with the publication of a major monograph by Scala in conjunction with NMWA, Salon 94, and Jessica Silverman Gallery. In addition to a life of prodigious art making, Chicago is the author of numerous books: Through the Flower: My Struggle as a Woman Artist, 1975 (subsequently published in England, Germany, Japan, Taiwan, China, and France) and most recently made available as an e-book; The Dinner Party: A Symbol of Our Heritage, 1979; Embroidering Our Heritage: The Dinner Party Needlework, 1980 (also published in a combined edition in Germany); the Birth Project, 1985 (Anchor/Doubleday); Holocaust Project: From Darkness into Light, 1993; The Dinner Party / Judy Chicago, 1996; Beyond the Flower: The Autobiography of a Feminist Artist, 1996 (Viking Penguin); Fragments from the Delta of Venus, 2004 (powerHouse Books) and Kitty City: A Feline Book of Hours, 2005 (Harper Design International). In 2014, Institutional Time: A Critique of Studio Art Education, was also published by The Monacelli Press. Penn State has established an on-line dialogue portal as part of Chicago’s art education archive in order to achieve the goal she outlines in this book, i.e., an international discourse about the future of art education. For over five decades, Chicago has remained steadfast in her commitment to the power of art as a vehicle for intellectual transformation and social change and to women’s right to engage in the highest level of art production. As a result, she has become a symbol for people everywhere, known and respected as an artist, writer, teacher, feminist and humanist whose work and life are models for an enlarged definition of art, an expanded role for the artist, and women’s right to freedom of expression. In 2018 Chicago was named both one of Time Magazine’s “100 Most Influential People” and a 2018 “Most Influential Artist” by Artsy Magazine. Her work is in the collections of the British Museum, Moderna Museet (Stockholm), Metropolitan Museum of Art (New York), National Gallery (Washington DC), Los Angeles County Museum of Art, Museum of Contemporary Art Los Angeles, Hammer Museum, Getty Trust and Getty Research Institute, San Francisco Museum of Modern Art, Tate Modern, Crystal Bridges Museum of American Art, Art Institute of Chicago, and over 25 university art museums such as Brandeis, Cornell, Harvard, Illinois, Michigan, UCLA, Canterbury (New Zealand) and Cambridge (UK). Judy Chicago is represented by Salon 94 in New York and Jessica Silverman Gallery in San Francisco.For more information about Judy Chicago’s work, please visit www.JudyChicago.com and www.throughtheflower.org.